I finished reading The Iron King today, it took me three days to read this book (in my defence I was also preparing for a job interview). This book made me fall in love with fairy tales again. The story starts, as all good fairy tales do, with a loss, this is narrated in a very matter of fact way by our narrator, Meghan Chase. It is through her that the story is told, we are introduced to her brother, mother and step-father and her world. 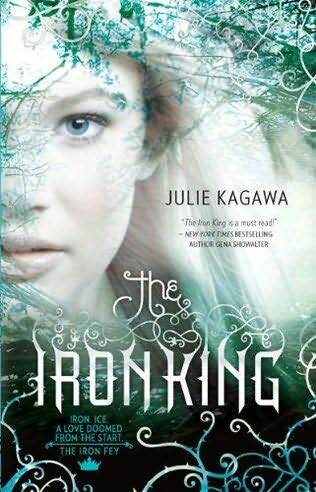 The Iron King mixes old fairy stories with modern 21st century life, and the travails of being a teen – unrequited love, cyber-bullying and some truly creepy scenes involving Meghan and Ethan (especially when he tells her what his toy bunny whispers to him). The Iron King is not a new story, it takes the oldest tales of the fey and the dangers they represent and makes them new again. When Ethan is stolen away and replaced with a Changeling, Meghan risks everything to follow him into the Nevernever with only her oldest friend Robbie Goodfell (a puckish lad) at her side to guide and defend her, but even he is something more than he seems. The faeries in this book are the Lords and Ladies of the old tales; ancient, proud and utterly inhuman, but possessed of the finest courtly manners. In the courts of the fey beware of what you say or promise as words have power and your word. Meghan learns that both Seelie and Unseelie Courts are weakening but neither hold her brother. To find him she must brave the terrors of the Iron King and an new, unknown power growing hidden within Faery – the Court of the Iron Fey.